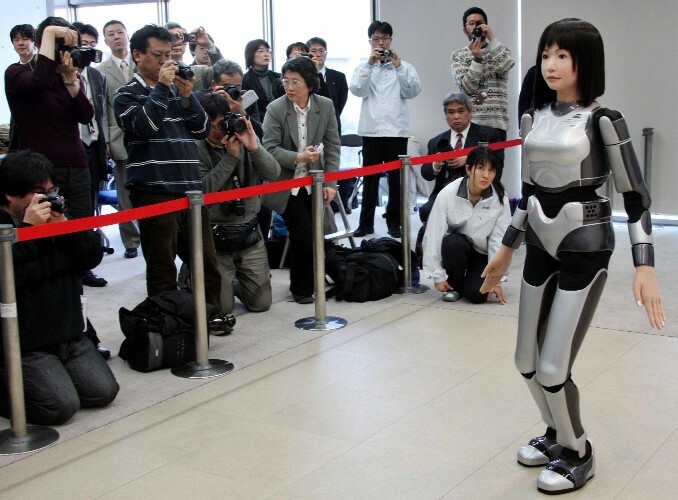 TSUKUBA, Japan (AP) -- A new walking, talking robot from Japan has a female face that can smile and has trimmed down to 43 kilograms (95 pounds) to make a debut at a fashion show. But it still hasn't cleared safety standards required to share the catwalk with human models. Developers at the National Institute of Advanced Industrial Science and Technology, a government-backed organization, said their "cybernetic human," shown Monday, wasn't ready to help with daily chores or work side by side with people -- as many hope robots will be able to do in the future. "Technologically, it hasn't reached that level," said Hirohisa Hirukawa, one of the robot's developers. "Even as a fashion model, people in the industry told us she was short and had a rather ordinary figure." For now, the 158 centimeter (62.2 inch) tall black-haired robot code-named HRP-4C -- whose predecessor had weighed 58 kilograms (128 pounds) -- will mainly serve to draw and entertain crowds. I must say fashion models may hate this and they'll lose their job. She's a bit shorty though. That looks real cool, anyway it's never a problem for Japanese to make real nice faces for robots/dolls.